As indicated by the name, fixed or term deposits have a pre-determined tenure and interest rate for the principal amount invested in these accounts. The primary objective of fixed deposits is to help investors mobilize investible surplus and earn a higher interest rate. In addition, these kinds of deposits are safer investment avenues because the maturity amount is fixed at the time of opening the account. This means that investors are safeguarded against market fluctuations or interest rate changes. Compared to a regular savings account, returns on fixed deposits are higher making these an excellent investment option. 1. Lock-in period – A term deposit cannot be withdrawn until maturity. If you need to close this account before the end of the term, you will have to incur certain penalties. This discourages premature withdrawals and encourages individuals to save, while also helping with accurate financial planning. 2. Higher returns – Instead of leaving the surplus in your savings bank account, this amount can be transferred into a term deposit. This allows you to earn a higher rate of interest on the surplus amount, which can be a step towards making your money work for you. 3. Safe investment – The interest rate is determined at the time of opening the account, which means that irrespective of any changes to market rates, you are assured of receiving the predetermined maturity amount. The bank deposit interest rates vary from one institution to another, so it is advisable to check these before opening your term deposit. 4. Meet financial goals – Because you are aware of the exact amount you will receive on maturity when you apply for term deposits, you are able to plan your finances in very precise manner. These investment avenues can be useful in meeting medium to long-term financial objectives. 5. Flexibility – You can choose to receive the interest on term deposits at their preferred time intervals. You can opt for monthly or annual payout or decide to withdraw the entire amount on maturity. 6. Variable duration – These deposits can be opened for a minimum of 7 days or for a maximum of 10 years. This means that you can enjoy great flexibility in the duration of investments, based on personal needs and preferences. 7. Multiple accounts – There is no limitation on the number of deposit accounts that you can open. You can setup new accounts each time you have an investible surplus to help grow your wealth and meet future financial goals. Term deposits earn interest with a compounding effect on the initial principal invested. This entire amount enjoys compounding interest benefits during the entire duration of the deposit, which makes it a lucrative investment option. In addition, investors can avail loans against their deposits, which give them the choice to avoid closing the deposit before its maturity – an act that normally entails severe penalties. Loans are available between 70% and 90% of the deposit value that can be used to meet emergency fund requirements. With all of these benefits and features, it should be fairly obvious that bank deposits are an excellent option for investors who want to earn higher returns on their investible surplus. Tejas Kunder is an independent blogger and writing has been his passion for a long time. A journalism grad, he loves exploring the world of sports, health, lifestyle and travel. When he’s not writing, he’s out on his bike discovering new places, apart from that he loves listening to music and catching up on the latest flick. A fixed deposit (FD) is an investment avenue through which investors deposit a certain sum for a specified period of time. The financial institution or the bank agrees to pay interest on the invested amount at the end of the specified period. This instrument has been a favorite avenue for people looking to increase their savings. However, newer options like equities, mutual funds, and real estate have gained more popularity, especially among younger investors because there is a greater possibility of earning higher returns. Nonetheless, FDs remain popular as an investment avenue for many individuals. Many investors choose to invest in FDs to save their income tax liabilities. The interest on the FDs can be beneficial in saving a significant amount as taxes, as per the Income Tax Act. Investors are advised to calculate their returns, based on their income tax slab in order to better plan their finances. The returns, made from the compounding effect of these deposits, provide more benefits to investors. Moreover, individuals know the exact amount they will receive on maturity, which is an excellent way to plan their finances. It is advisable to use this instrument to meet certain financial goals that have a fixed date. Financial institutions provide secured credit cards, loans, and top-up facilities on existing loans against your FDs. When these credit facilities are used in a prudent and efficient manner, they can help investors significantly improve their credit scores. This proves to be even more beneficial in the long run. Several institutions allow investors to partially withdraw the amount from their FD accounts for a certain fee. Individuals can also prematurely take out the FD amounts. This flexibility ensures that investors do not have to feel stressed in case certain emergencies arise. Investors can be assured of receiving their entire investments based on the fixed deposit rates on maturity, irrespective of economic or other circumstances. The returns do not depend on market fluctuations and are not affected by the downward movement of interest rates. Therefore, FDs are a safe and secure investment vehicle, especially for investors who are nearing their retirement ages. These deposits can be opened by individual, business, or institutional investors. Most service providers require identity proof along with address proof, when opening an FD. Some of the acceptable documents include PAN card, voter ID, utility bills, driving license, and passport. FDs offer a convenient and safe investment avenue, where the capital is at no risk and investors can earn decent returns on their investments. There are several institutions that offer different kinds of deposits and it would help to check these out before making a final decision. Click here to know more about fixed deposit and their interest rates. How I View a Sum of Rs 1 Lac These Days? Since I’m currently in the highest income tax slab, each bundle of Rs 1 lac that I save moves me in the worst case Rs 500+ per month closer to my ere-goal. Save two bundles and I’m suddenly Rs 1,000+ per month closer to my ere-goal. Psychologically, I think this breakdown into smaller targets seems to have spurred me. Rather than thinking along the lines of “Oh! I still need to save X-gazillion number of rupees and God alone knows when I will get there,” I now have started to think along the lines of “Oh! I only need to save Y bundles and I’m there.” Somehow this line of thinking helps. Posted on a slow Friday afternoon. And I realize that I am dreadfully overdue on announcing the winner of the September Book Giveaway. About a week back, I received a PR email from IDBI Bank announcing the launch of their Floating Rate Term Deposit scheme. Thought I’d look it up and give you a quick review (a side effect being the evaluation of this scheme for it’s suitability in my ere portfolio). If you’re still reading, I’ll assume that you’re a pretty savvy investor. So, I’m going to highlight some of the nuances that aren’t readily inferred from a casual read of the product literature. The minimum term is 1-year and the minimum lock-in period is also 1-year. That’s a disadvantage because given the current market scenario, you’d definitely want to have as much financial flexibility as you can. You don’t get that when premature withdrawals aren’t allowed for a year. The base interest rate is reset each quarter but the mark-up (what you get over and above the base interest rate) is only reset once every year. While, the base interest rate is pegged to the 364-Day Treasury Bill, the mark-up seems to be an internally calculated number. So, while you can have your personal opinions about the T-Bill rate movement, you don’t have even that choice on the mark-up. I think the mark-up would be adjusted to keep the total interest rate competitive in general to what’s available from other Banks. I couldn’t determine what would happen if, for example, you open a new FRTD on, say today, 03-Sep-2012. Would your interest rate be reset at the next fixed quarterly reset point of 01-Oct-2012 or at the point when your FRTD crosses a quarter (on 02-Dec-2012). I’m guessing it’d be the former but it’d be better to clarify with the Bank. Personally speaking, I won’t be taking this up for my ere portfolio. Vis-à-vis fixed deposits, I’m currently doing much better elsewhere and with a monthly payout (the FRTD offers a quarterly payout and the other thing I’m not sure about the product is whether the interest accumulated is compulsorily paid out each quarter). The product is likely to appeal to the retail investors who borrow at floating rates (say, for home loans) but invest at a fixed rate, and are consequently exposed to high interest rate risk. FRTDs ensure that their loans and deposits move in tandem and would help to partially immunize their asset-liability portfolio from such risks. Investment in FRTDs is also beneficial when the interest rates are expected to rise as it enables the investors to take advantage of periodic increase in the market rates. In a rising interest rate scenario, the customers generally go in for short term deposits and keep rebooking them as and when interest rates move up. FRTD would help do away with this cumbersome process. I contest the first argument because say when home loan rates go down why would you want your deposit rates to also go down in tandem? You’d always want to earn as high as possible on your deposits no? I contest the second argument because there’s no published logic for calculating the mark-up. That said, do you think this product has a place in your portfolio? Seems my colleague wanted to get a borewell dug at their residence. But when the contractor visited her premises for a site evaluation it was discovered that the compound wall of the house had to be torn down in order to accommodate all of the digging machinery. So when all the costs (including reconstructing the compound wall) were added it ran up to around Rs 200,000. 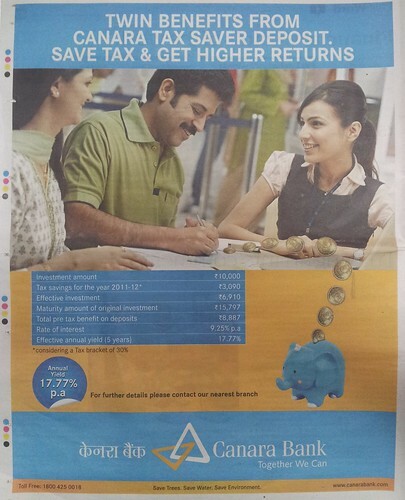 Rs 200,000 in a fixed deposit would yield around Rs 18,000 per year at 9% rate of interest. That’s about Rs 1,500 per month or Rs 375 per week on an average. The cost of a tank’s supply of water in that area is around Rs 300 — Rs 350 and that water lasts for about a week. So, it makes no financial sense to go ahead and dig the borewell. Not only does the interest earned from the fixed deposit cover the cost of external supply of water but you get to keep the principal amount as well (rather than it becoming a sunk cost and really sunk if the borewell were to run dry). Investment Calculators: How to Calculate the Maturity Value and the Returns or Yield on a 5-Year Tax Saving Fixed Deposit? Following-up on my previous post where I illustrated through a real-world example the way to calculate the maturity value and effective yield on a five-year tax saving fixed deposit (FD), I hacked-up a simple Android-application that helps you do the same in an instant wherever you are. 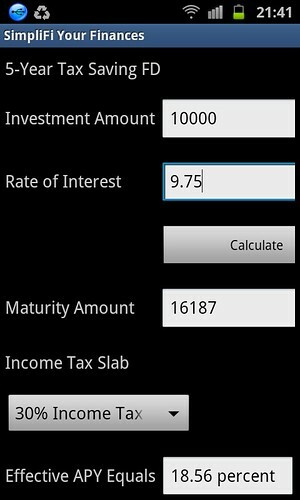 Click here to download the 5-Year Tax Saving FD Calculator Android-application. If you’re adventurous enough, it’s an unsigned .apk file that you can quickly install and run on your Android-phone (I’m still figuring out other mobile platforms). Let me know if you run into any trouble — it should run fine on most Android environments. 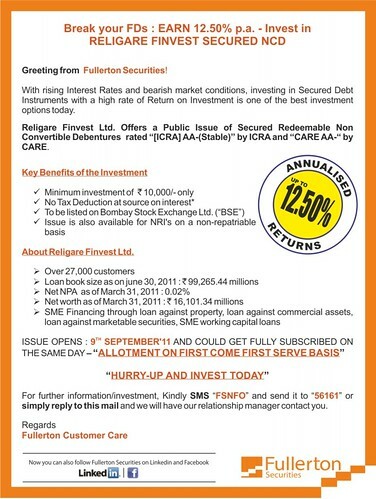 Enter the Amount that you wish to invest in the Tax Saving FD of your choice. Enter the Rate of Interest published by your Bank. Click on the Calculate button. The Maturity Amount (of maximum interest to you) is auto-computed and shown. Choose the Income-Tax bracket that you come under. The Effective Annual Yield is auto-computed and shown. 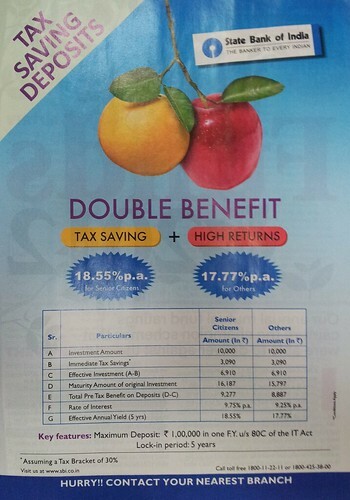 Here are two recent advertisements for 5-Year Tax Saving Fixed Deposits. 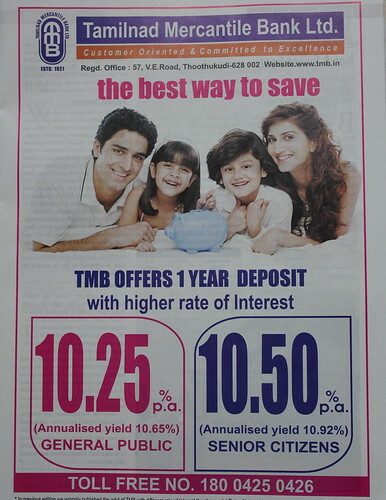 In both cases, I believe that the Effective APY of 17.77% shown in the ad for a Rate of Interest equal to 9.25% is wrong. (unless I am missing something?) The results however do tally for a Rate of Interest equal to 9.75%. Let me know if you found this application useful. How Have My Fixed Maturity Plans (FMPs) Fared In the Past One Year Compared To My Fixed Deposits (FDs)? In the past one year, my Fixed Maturity Plans (FMPs) have fared only slightly better than my Bank Fixed Deposits (FDs) of comparable tenure. A 1-year FMP from IDFC achieved an APR of 10.05% (equal to an APY of 10.44% with quarterly compounding). A 1-year FMP from SBI achieved an APR of 9.89% (equal to an APY of 10.26% with quarterly compounding). A 1-year FD from HDFC Bank achieved an APR of 9.25% (equal to an APY of 9.58% with quarterly compounding). Ignoring the complexities of investment timing and income tax, that’s less than a percentage point in difference! Have you seen anything different with your FMP and FD investments? Here’s how you do the APR (simple interest) to APY (compound interest at a certain compounding interval) conversion. If you’re totally lazy to the APR to APY conversion by hand, here’s a quick Android-application that I hacked. If you’re adventurous enough, you can download the .apk file and install it on your Android-phone as an unsigned application. Let me know if you run into any trouble — it should run fine on most Android environments. Quite a number of readers had written in asking me to explain the difference between APR and APY. APR = Annual Percentage Rate. Think of this as simple interest. APY = Annual Percentage Yield. Think of this as compound interest. APR and APY explain why your Fixed Deposit certificate quotes an interest rate of 9% but upon maturity you get an interest amount that is slightly higher than what you’d actually get at 9%. APY = APR compounded at a certain compounding interval. Look at this illustration (click on the image for a full-size version). That explains the difference between APR and APY. Let me know if you have any questions. Note: With Credit Cards you might sometimes see a monthly-APR quoted such as 3.1% per month. Simply multiply this by 12 to get the annual-APR. In this case, the annual-APR is 3.1% x 12 = 37.2%. Should You Invest Your Money in Company/Corporate Fixed Deposits? You should think about investing in company fixed deposits only when you have some surplus cash that you’re prepared to lose should the worst were to happen. Be prepared to do some independent research on the company. If the company in question is already drowning in debt but the investment prospectus talks about raising money for expansion, you wouldn’t want to handover your money to them would you? Don’t be swayed by the brand name. A company fixed deposit from a well-known brand doesn’t automatically mean it’s a good investment avenue for you. Don’t be swayed by Investment Ratings/Grades from Ratings Agencies. They generally don’t mean much to you — it’s not as if anyone is guaranteeing anything to you by giving out such a number. Why would I ever want to break my ultra-safe Fixed Deposit(s) that currently earn a handsome 9% — 10% per annum and instead invest my money in something that’s much much riskier (AA-!) and only assures me up to 12.50% per annum? The risk premium ought to be much higher than a measly 2.50%. Hike that up to 5.00% and I might consider investing some spare money. But I wonder what’s the spread on this one. I also wonder what the money mopped-up is being used for. Hope you haven’t broken your Fixed Deposit(s) for this one. Investment Strategies: How Can I Structure A Job Loss Emergency Fund? I want to set aside an emergency fund purely to handle any loss of employment situation that I might face. What would you recommend? 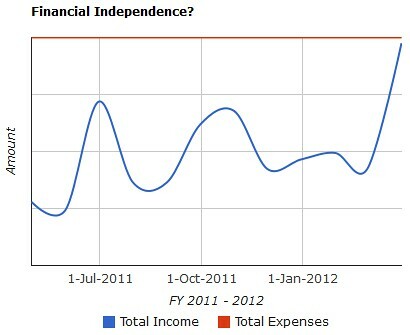 First, estimate your monthly expenses (including EMIs, monthly savings for annual expenses, and routine household expenses). Let’s say this amount is M.
Structure a 6-month fixed deposit ladder (i.e. one fixed deposit each month for six months with each fixed deposit maturing in six months). Each fixed deposit should have it’s face value equal to M.
Now suppose you do lose your job. You only need to wait for that fixed deposit with the nearest maturity date to mature, close it, and use the proceeds for your monthly expenses. Of course, once you’re back in a job, you will need to put the ladder back in place. I also believe that the interest you earn will more or less account for any inflation, but when you don’t have a job, concerns about inflation should be the last thing on your mind. What should be on your mind, however, is frugality. How does this strategy sound? Investment Strategies: What Should I Do With The Joining Bonus I Received At My New Job? I’m being offered an upfront joining bonus by my new employer. How should I go about investing this money? There is one condition though. I will be required to give back this money if I leave the job within 6 months. Given the payback condition, I’d recommend that the joining bonus be kept in a 6-month fixed deposit — don’t even think of investing it right now. If you do leave the job within 6 months, you can break the fixed deposit and give back the money to your employer. And if you don’t, the money is fully yours and unencumbered and you need to use/save/invest it to meet your financial goals.